Listening to pianist Heidi Breyer's newest album, Moonlight in Empty Rooms I have come upon a happenstance where an old adage must be changed. I would now say it like this; "A picture is worth a thousand notes." Breyer's work is contemporary piano at its best with twelve intoxicating instrumentals of light ensemble and solo piano works inspired by the muse of her dreams and the works of her husband realistic painter, Alexander Volkov. Let’s talk about Volkov first. Alex is an extraordinary painter whose heart and eyes transform everyday scenes into art that has to be seen to be believed. That being said, Breyer seems to have the same kind of magic. She sees with the eyes of her heart and transmutes that emotion of a visual into a glorious tune. All of the tracks on 'Moonlight in Empty Rooms' are written in response to a Volkov work. There is a bonus gift in the album package, a DVD that shows you melodically, the correlations that are possible when the two mediums are matched up. This is a review written for two. The album opens with the Unfinished Conversation. A candle hastily blown out and the remnants of wine in the bottom of a duplet of glasses are all the fragments of a promise. There is more to come. Heidi's crescendo is a display of emotion that claims nothing is yet finished. The tune then settles into an idyllic flow accompanied by violinist Charlie Bisharat. The colors in this one are muted, the quality poignant and polished. Autumn in Bruges is music for lovers. As it played I could picture a couple as they sit by the canal. They order up sweet wine and they laugh at each other's corny jokes. He reaches for her hand just as the sun utters goodnight. Volkov captures the moment in shadows and reflections. Heidi's music, like Alexander's light, splashes onto everything giving it more life. Heidi's tune is soft and sweet, and almost introspective at times. 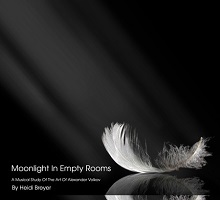 The title tune Moonlight in Empty Rooms begins with a brief, but haunting violin intro. Heidi's theme takes over and it is lush and expansive, yet thought provoking. Volkov's painting in subdued grays and whites offers stripes of moonlight that fall across the floor in an unoccupied space. The moonlight is so bright that you can imagine the motes floating in the air. The scene and the music invites you in to make your own scenario. Place the characters, open the windows, and arrange the furniture. Make it your own. It is music of opportunity, a pas de deux of unseen souls. It is the best cut on the album in my mind and one that I played over and over. I have always been a pluviophile, a lover of rainy weather so Rainy Day also became a favorite. Volkov offers a bunch of cornflowers in an old Mason jar positioned in front of a window. Rivulets run down the glass. But the sun may be ready to come out any minute. Breyer musically captures the scene just as the clouds begin to part. Her rich, memorable score is a bit melancholy, but it brightens quickly. Half Hour Before Spring, the painting, is what Volkov does best. He freezes a moment in time and we become witnesses to the instance. The pastel colors of dawn invites us in and we can feel the warmth as it softens the air. Heidi uses that subtle change in morning light to draw us to the music. Counterbalanced with the violin, she uses hopefulness in the notes to beckon us into the changing of the seasons. In the picture, there is still an icy glaze on much, but the music portends the first green any second now. There is a sense of sadness to see winter saying goodbye. A white church on a hillside of fall grass is the subject of Faith. The background features storm clouds, but the church is bathed in a pure, white light. That is faith. This complex, harmonically rich refrain is balanced by the violin that plays the part of the questioner and the piano which eventually offers grace. There is a sweet sadness to it all. It suggests the feeling of saudade, the sense that one's soul is searching for something it does not understand. Bisharat’s finale will give you chills. Violinist Charlie Bisharat was the perfect accompanist to Heidi Breyer's music. He has a method that is complimentary, more that obtrusive, like a friend who always knows just what to say. Breyer, herself wields alchemy on this album, confirming the ongoing partnership with more than a kindred spirit in Alex Volkov. The simpatico is phenomenal. Breyer is at the present at an apex in her composition skills, but I feel there is more to come. There is a notable intricacy from her previous releases, which makes you want to hear more. Despite what John Keats once said, we have heard the melodies and they are far sweeter. Mr. Keats, let me introduce you to Heidi Breyer, the composer.